The first time I saw a video clip of Jero, the African-American who took the Best New Artist prize at the Japan Record Awards on New Year’s Eve, I experienced a feeling of deja-vu. He was making one of his first appearances on Japanese television and a panel of Japanese celebrities sat in awe as they watched him sing traditional enka music in perfect Japanese. I’d garner this very same reaction among Japanese people whenever I sang in Japanese in the various contests and appearances I made, and two of the chestnuts Jero warbled were standards of the genre I learned years ago. There can be a real disconnect for Japanese to see a person who seemingly has no Japanese blood, speaking or singing in perfect Japanese and, despite changing times and the supposed sophistication of Japan, this still attracts attention, both welcome and unwelcome. 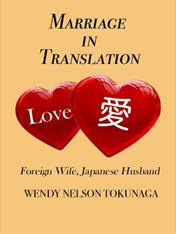 I have tackled this subject in my next novel, Love in Translation, which will come out this Fall. Turns out Jero (born Jerrold White in Pennyslvania) is 1/4 Japanese and learned these songs from his maternal grandmother who was from Japan. He now has a contract with JVC Records and a hit song under his belt, as well as his aforementioned award, and an appearance on the Kohaku Uta Gassen, the prestigious New Year’s Eve live television program that brings together many of Japan’s most popular recording artists on one stage. On that show, which I watched via the local San Francisco Asian TV channel, Jero pulled all the typical sentimental stunts, paying tribute to his grandmother (she died three years ago, missing his success) with her picture emblazoned on his shirt while his mother sobbed in the audience. His eyes were brimming with tears by the time his performance was over. But the real brilliance of the marketing of Jero is that he dresses in a way that Japanese expect black people to dress—in hip-hop regalia of jaunty caps, baggy pants, and bold necklaces, and not the kimono or traditional suits many enka artists wear. It is claimed that he has brought a breath of fresh air to stodgy enka, which has been compared to American country or blues (but that really doesn’t do it justice), as well as youth, to a genre where most of the singers are in at least their thirties, and more often in their fifties and older. Jero is just twenty-three. Can Jero have a long-lasting career in enka or will he only be a novelty like so many mixed-race or non-Japanese singers often become in Japan? And will he ever win the coveted final performance slot on the Kohaku as another young enka singer (albeit Japanese born and bred), Hikawa Kiyoshi, did this year (and who wept profusely at the honor)? It will be interesting to see what the future holds for Jero. That is great that you are into Enka. I am doing band called Soul Of Japan. Someday I want to invite to sing at my concert. You can listen all my tracks full length here. The Japanese Cultural and Community Center of Northern California (JCCCNC) is presenting Jero in Concert on March 28, 2010, 4:00 p.m. at the Palace of Fine Arts in San Francisco.